It’s a saying we’ve all heard before. While jackets are still important for avoiding sickness, three health IT companies are developing new tools that not only prevent illness, but also accelerate healing and make healthcare convenient for patients. Here’s the rundown on some Canadian companies that are keeping us healthy this season. 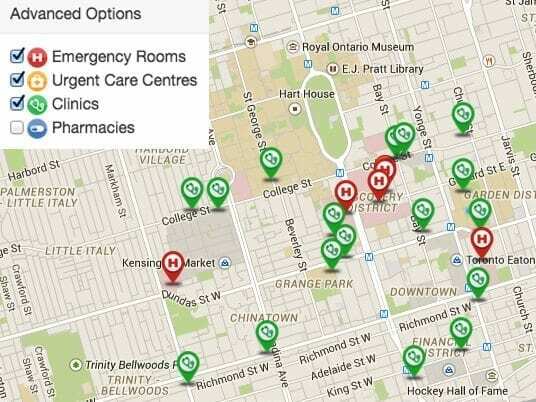 iamsick.ca enables web-based or app-based access to information about nearby healthcare options. This free navigation service allows users to search and select walk-in clinics, urgent care centres, emergency rooms and pharmacies according to the parameters they set. For example, users can filter through potential healthcare centres by looking at the options’ operational hours, languages spoken, estimated wait times and distance. By leveraging data and mapping software, the platform redistributes patient flow at these concentrated locations. Patients can now choose the most convenient care options for them. The platform currently supports healthcare options in Ontario and plans to expand into other provinces, eventually mapping all of Canada. In the meantime, iamsick.ca is launching new features. The company recently launched an online service to book flu shot appointments for the campus pharmacy at Queen’s University, and is working to expand these services into other locations. By booking online, users can sit in a “virtual waiting room” and view real-time wait times remotely. This means that, instead of sitting in a waiting room, users can track their wait time and arrive at the clinic at the exact time of their appointment. The company was at MaRS recently for the TechnoShowcase with 40 other startups offering hands-on demonstrations of its platform. MolecuLight Inc. is a medical imaging company developing handheld optical imaging technology that can visualize bacteria, resulting in rapid and accurate diagnosis. The company’s technology is based on the detection and analysis of intrinsic fluorescence signals emitted by tissues and microbes when illuminated with specific wavelengths of light. The device will enable clinicians to quickly visualize both the presence and distribution of bacteria in skin and chronic wounds, which is incredibly important in the global wound care market. This is essential because diagnosis of wound infection currently relies on clinical judgment, which is subjective and varies from clinician to clinician. Current solutions in the industry today include microbiology culture-based tests, which can take days to get results. MolecuLight’s device will enable clinicians to gain detailed insights into the bacterial composition of a wound, helping to guide sampling and treatment delivery. MolecuLight recently announced a multi-project based research agreement with the University Health Network (UHN) aimed at advancing its new handheld optical imaging technology. This UHN-MolecuLight collaboration will allow for future expansion of the current applications of the company’s proprietary fluorescence imaging technology platform. Canadian company Chematria has programmed Canada’s fastest supercomputer with an algorithm that can predict the effectiveness of new medicines. The supercomputer uses an algorithm that simultaneously stimulates and analyzes potential medicines to predict their effectiveness. Chematria’s drug-discovery technology helps pharmaceutical companies identify which molecules could become medicines. The company has recently partnered with the University of Toronto and IBM to work on an initiative that will search for new treatments for the Ebola virus using this artificial intelligence. A “virtual brain” drives the entire system, studying millions of data points, applying patterns and suggesting new uses for existing drugs. Chematria allows researchers to explore new drug options without the costly physical testing and in a shorter time period. These benefits make Chematria’s technology ideal for researching treatments for pandemics like Ebola, when researchers are under serious pressure and time constraints. Learn more about Chematria’s technology by reading our MaRS blog feature or watching the company’s recent interview on CTV News.